Mary Green explains the importance of oak trees in England. We have had drama among the canal swans again, with one of the cobs (males) getting a fisherman’s lure embedded in its beak and mouth. He’s OK and clear of it now but it was touch and go. Meanwhile the chiff-chaff has arrived and is singing away along the canal among the cherry blossom and the first hawthorn and bluebell flowers. This month I am looking at one of the trees that is especially beautiful at this time of year. The oak usually begins to show its leaves at the end of April, but this year is very early, way before the ash, which should mean a good summer! By the start of May it has a glorious show of gold-green leaves, along with little sprays of flowers. It is so much a part of our landscape here in the Village area that we tend to take it for granted. Oaks are the most common trees in England, and one of the largest and potentially oldest. Many around here are 500 years old or more, and across the country they can live to twice that. Our English oak is one of a family that has varieties all over the world. The English oak’s Latin name is Quercus Robur, the second part of the name meaning strong or robust. It is a very enduring and tough tree, which perhaps explains why it has had a presence in mythology, religion and national identity over the centuries. If you look at oaks now, you will see the little tassels of yellow-green flowers. These are the male flowers; the female ones being smaller and less noticeable. They form the fruit of the oak, which is the acorn. The flowers are timed so that the pollen blows in the wind from tree to tree, with the male flowers ready before the females so they are more likely to pollinate another tree. This cross-pollination is good for the tree, mixing the gene pool. Young trees don’t make acorns. They usually reach between 20 and 40 years old before they fruit. When they do fruit, though, they can produce large numbers of acorns. The crop varies from year to year, usually with a large number occurring every three years or so. The acorn has the seed inside and a lot of very nutritional matter to feed the young plant. This is also much desired by animals and birds. Because of this, very few of the thousands of acorns actually germinate into a young sapling. They are taken away by squirrels, mice, and other mammals, and jays, pigeons and other birds. However, this does mean that they are spread away from the parent tree, which is good for the oak. One or two will be dropped by the animals and birds, and they will readily grow. The habit of the tree, producing an uneven crop, small in some years then a huge fruiting, gives them an advantage. The animals that feed on them can’t predict where the crop will be, and it will sometimes be so big that some are bound to survive. The tree grows reasonably quickly when young but then slows down. This type of slow-growing tree becomes very strong and has very hard wood. Its long life and clever fruiting habits mean that it has survived well over the centuries, despite its seeming to have a difficult reproductive cycle. Oaks grow with massive trunks and many branches. Sometimes in the past they have been coppiced or pollarded and will grow several trunks – this can happen naturally too if the tree is damaged when young. They have a very distinctive shape, with not a straight line in sight. Each twisty branch grows into smaller twisty branches and twisty twigs. Sometimes in old trees the top of the tree dies off. This doesn’t mean the tree is in trouble. It usually happens when the tree feels it is short of water. It reduces its height and gains greater strength this way. The size of oaks mean that they need vast quantities of water – perhaps why they like England! They don’t grow in water, but are very happy beside streams and canals where the ground holds moisture. Oaks are a great host for other wildlife too, considered to be the most biodiverse tree. The bark holds many different insect species, including moths and beetles. Birds, and some animals, readily nest in the hollows that appear in older trees, and in the leafy canopy. Animals and birds live on the acorns. Fungi grow on both the live trees and on dead branches. Oaks grow readily both in woodland and as solo trees. The leaves come fairly late and are light at first, so they let in sunlight well into May. This means other plant species grow readily under them. Oak woodland has a special affinity with bluebells, and all the other old woodland species: yellow archangel, wood sorrel, wood anemones. Oaks have a long tradition of human affinity to match their old age. The English oak has become the national symbol of England, but other oak species are given the same national status elsewhere in the world. The hardness of the wood, coupled with the fact that it could be split easily even with a stone axe, mean they oak has always been used for important constructions. In the Bronze Age there were “wood henges” similar to the better-known Stonehenge. These were usually oak, and the wood has been preserved in bogs in some places so they have survived. There is an ancient trackway in Somerset made of oak planks, dating from several millennia BC. Legend has it that King Arthur’s Round Table was one huge piece of oak. Ancient Celtic traditions, as well as Norse and Graeco-Roman ones, give a special place to the oak (for example, it was the tree of Zeus, the chief Greek god). It is usually the king of trees, sometimes a god in its own right. The oak in all these traditions has a special relationship with lightning. It is sometimes associated with the god of thunder. There is a simple explanation of this: the oak is often the biggest thing around in the landscape and will naturally attract lightning. One belief was that when lightning struck the oak, mistletoe was formed. This myth was called the “golden bough”. Other traditions say a grove of oaks grows near the entrance to the next world, or near anywhere that the gods speak to human beings. In the Celtic traditions, each of the 13 lunar months has a special tree. The oak is the tree for the period of late May–early June. In England, Oak Apple Day is May 29, and there have always been celebrations including the oak about this time of year. “Oak apples” are not the fruit of the oak but one of a number of galls which form on oak trees in response to the developing larvae of a gall wasp. Oak leaf galls contain a substance which was used at one time for ink. The Magna Carta was written in oak leaf gall ink. The reason for the English festival, though, is that the oak became a national symbol and a symbol of the English monarchy. This was especially so after King Charles was said to have hidden in an oak tree. 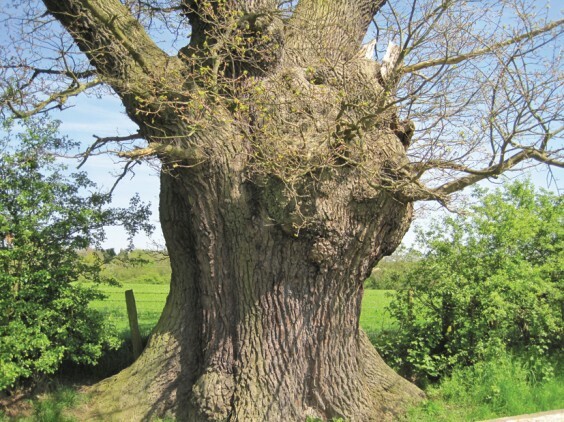 This gave the tree the name of the Royal Oak, which became the third most common pub name in England! The idea was strengthened by the fact that oak wood was the chief material for ship-building right up to the 19th century. With England being such a maritime nation, the oak ship became a symbol of the country’s success. The oak became at some point associated with St George, that other symbol of England. It’s interesting that the oak is used as a national symbol in many other countries, and that St George came from the Middle East! We have always been great borrowers. But St George also takes on many of the mythical elements of older legends. He is linked to the Green Man, the spirit of the earth who haunts our folklore. And the Green Man is usually depicted wearing a wreath of oak leaves. There are old stories about weddings being conducted under oaks, and if you make it that long your 80th wedding anniversary will be your Oak Wedding! Oaks were used to mark parish boundaries. Some of these are called Gospel Oaks and have special significance at Rogationtide in the church calendar. They were even county boundaries. I remember in my student days at Leeds drinking in a pub called the Skyrack. This odd name was a corruption of scir ac, the Anglo-Saxon words for shire oak. Nearby was another pub called the Original Oak. And of course Selly Oak in Birmingham was the selig ac, or holy oak. It’s appropriate that oaks are used as pub names, as one of the uses for oak wood was in barrels. Not only beer but wine and whisky get some of their flavour from being matured in oak. Oak bark contains a lot of tannins. These make most parts of the tree poisonous to us, and to cattle and horses, but not to pigs. Acorns were staple food for pigs for centuries. But the tannin was extracted to use in tanning leather, and contributes to the flavour it gives drinks. The bark was thought to have healing properties, probably because of the tannins, and was used to treat bowel problems and as a diuretic. Acorns can be eaten by humans when processed, and in pre-farming days were ground and used as flour, until they were superseded by grains. Evidence of this is so widespread that some archaeologists have said there is a distinct link between human settlement and oak trees in ancient times. Acorns found a use again during the Second World War, when they were roasted and ground to make an ersatz coffee when imports were difficult. Where is the best place to find oaks round here? You can find some mighty specimens all over our area. Try The Meadows and Scarfield Dingle in Alvechurch, the edge of the old Alvechurch Park in Rowney Green (including the famous Calling Oak), and the Old Orchard near Barnt Green. Oak woodland can be found in Peck Wood in Rowney Green and Pinfield Wood near Barnt Green. My favourites are the lines of oaks you find marching across fields, showing old boundaries. I can see one from my window, and once you spot them you’ll see them everywhere. There are good oaks by the roadsides too. Old Birmingham Road from Alvechurch to Hopwood has some lovely ones, as does Scarfield Hill. There are great examples along the canal, which must have existed before it, showing it was cut along existing boundaries. Look between Alvechurch and Grange Lane for these. Some of my favourite oaks are on the Crown Meadow estates – fine old specimens. When these groups of houses were built, some developers were a bit keen to cut trees down, but these have been saved and really make the landscape here attractive. If you look at a piece of scrub land, like the relic of Crown Meadow between the canal and the “dead arm”, you will see how young oaks grow and colonise the ground to begin to make new woodland. You may see among your oak trees some that look a little different. There have been some other varieties planted, not native English oaks. Some of these have noticeably large, long leaves – there are some of those near me. Some are the evergreen or holm oak, sometimes called the holly oak: one of these grows in Withybed Wood. Oak trees easily hybridise between different types, so you can find mixed varieties. Still, the majority round here are English oaks. Like so many trees, they are susceptible to diseases, especially if young trees are imported from abroad. So I’m glad to see that the hundreds of whips of young oaks growing in the fields above me and along the replanted railway line are English ones taken from local sources. Oaks have such a history of living usefully alongside us, and are such clever survivors and hosts of so much other wildlife, that it would be difficult to envisage life without them. Here is a recent poem about the oak. To listen, to shelter, to tend their pigs. From its galls came ink to fuel his pen. Grinding them as a food, the staff of life. Which held the seeds of lightning in their core. To shake its bright gold dust over our hearts.